I had been working in London all on my birthday. I as was meeting my daughter in Leicester Square and we did not have much time before we caught our train home. She introduced me to this pub and we had fish and chips and as I'm an old gent I do remember fish and chips like this. Great meal and good value. But to cap it all our bar lady/waiter was brilliant, you'll recognise her by the nice smile, excellent service and that flash of white in her hair. Her helpfulness, welcoming manner and warm personality really made my birthday. If only all bar staff were like her. Thanks. I had a lovely meal on Saturday night of fish and chips ,a fantastic pudding and drink and the price was very good, the food was great the service was excellent and the staff were very helpful, my mum and I didn't have a table booked but they found us a table that was reserved for 7.30pm and this was 6pm. I am disabled and walk with a disability aid and the staff couldn't do enough for us and the whole experience was fantastic and will definitely be coming here again. 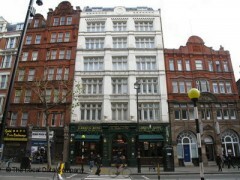 Situated in a great location, easy to get to from Leicester square tube. Lively pub atmosphere in a space with high ceilings. All the usual lagers, Guiness and Speckled Hen on tap. We went on a Friday evening and there was a friendly doorman/bouncer on the door. Recommended. almost a year passed over my visit to london and i still remember the place with its hospitality. a great place to chat with friends after a hard work day. the food was also great. hope to be there again.